When naming a newborn, you feel the weight of the decision, the fond hope that the right name might provide a push along a hoped-for path. Even as names seek to nudge destiny, sometimes they merely set up irony: Faith, the fiery atheist; Victor, the embittered failure. We can’t know all the thoughts that coursed through William Penn’s mind when he chose Philadelphia as the name for his new city, tucked onto the peninsula between the Delaware River and the Schuylkill. What we do know is that he chose boldly, aiming for the vault of heaven, daring irony to strike. The name he gave his city combined the Greek words for love (phileo) and brother (adelphos), setting up the enduring civic nickname: the City of Brotherly Love. Then Penn gave his city a street grid, a charter and a diplomatic first act that he hoped would enable it to live up to that name. So how did it turn out, this Holy Experiment? In modern popular culture, the verdict is often rendered with a sneer. “City of Brotherly Love” has turned into a phrase invoked more often in sarcasm than admiration. In 1994, a Gallup Poll named Philadelphia America’s most hostile place. The most durable stereotypes about the city cluster around its fans’ penchant for booing and the colorfulness of its crime and corruption. So William Penn’s choice can sometimes seem less destiny than irony. But that judgment is neither complete nor fair. It ignores so much evidence. Thanks to its founder’s impetus, and to the furthering energy of citizens from Benjamin Franklin to Richard Allen, from Lucretia Mott to John Wanamaker, from Richardson Dilworth to Mary Scullion, Philadelphia has remained one of America’s most inventive laboratories for exploring the civic potential of brotherly love and sisterly affection. Its history can be read as a long duel between destiny and irony, each vying to seize the upper hand in interpreting City of Brotherly Love. Philadelphia hosts a continuing dialogue about what brotherly love looks like in the civic sphere. Be clear on this: It won’t do to reduce the notion of brotherly love to saccharine sentiment, to feelings only tender and soft. Brotherly love does not imply the absence of conflict. Have you ever seen young brothers together? Their bond, strong as cement though it might be, gets expressed often as not through competing, jousting, gibes, and dares. Anger is also a way to express caring, and in Philadelphia’s long history, a common one. Even today, some of Philadelphia’s best rowhouse citizens, who work doggedly to keep blocks decent and children safe, regard their hometown with what can only be called an angry love. It is loyal, it endures – but it has spikes and edges. Like the nation that chose this city (and not by accident) as the spot to declare, then define, itself, Philadelphia has struggled to define brother. Who is inside the circle, who not? The city’s story follows a cycle: high aspiration thwarted by weakness, strife, and division, then redeemed by a new round of noble struggle, which broadens understanding and widens the circle. Penn himself, while nobly distinguished among colonizers for his fair and respectful relations with the native Lenape, had a blind spot about blacks. He owned slaves, and excluded blacks from many of the protections of Pennsylvania’s charter. While he founded his city upon a writ of religious tolerance that made it a rare and fruitful haven, he still excluded Catholics, Jews, and Muslims from the franchise. Some Quakers later on repaired the lapses of Penn and other forebears, becoming leaders of the abolitionist movement and the Underground Railroad. Richard Allen and Absalom Jones helped advance Penn’s vision of religious freedom by insisting that it extended to the black person as well. Abolitionist Lucretia Mott also sounded the clarion call that women, too, deserved a full role in America’s civic drama – that in fact, they were vital to bringing phileo to the polis. As Philadelphia thrived, thanks in no small part to Penn’s legacy of openness, immigrants poured in. The inevitable backlash flared, especially in the nineteenth century. The Nativist riots of 1844 in Kensington were anti-Catholic bias at its ugliest. But in the long run the disorder helped make the case for the consolidation of the city into a larger, more governable but also more diverse whole. Back and forth through the decades the dialogue flows around the city’s public squares, noisily and sometimes violently: Will the City of Brotherly Love embrace the destiny of its name, or reject it with cruel irony? Along with dark moments – riots and beatings and tribal corruptions – Philly has birthed great testaments to shared civic bonds, from Fairmount Park to the settlement houses to the Free Library to the Mural Arts Program. Its National League ball team once taunted Jackie Robinson most shamefully, but the Phillies now boast two beloved African American MVPs, whose jerseys are proudly worn on backs white as well as black. Through it all, the legacy of William Penn, his dreams, wisdom and example, still hums in the city’s blood – despite our cantankerous failings, our ritual suspicions about the latest bidders to join the circle of brothers and sisters. Philadelphia, by its very name, is an unfinished dream of civic feeling and common purpose, an audacious wager upon the better angels of our nature. We, the heirs and inhabitants of a city named for love, remain quick to anger, prickly and prideful, wary of the new. It is our way, and God knows we have some reason for it. But we are also stubborn in love, fierce in loyalty, and our embrace of those we let inside the circle is warm, protective and unfailing. We need to let more in, and more easily, with fewer tests. But we Philadelphians are young, still, in this Holy Experiment, and still learning. May the Spirit that inspired civic heroes such as William Penn, Absalom Jones, Barnard Gratz and St. Katharine Drexel to the heights of brotherly love and sisterly affection continue to guide us. Chris Satullo is Executive Director of News and Civic Dialogue at WHYY. Library of Congress (Explore in Animal Protection and Yellow Fever). Historical Society of Pennsylvania (Explore in Abolitionism, African American Migration, Insurance, Mother Bethel AME Church, and Yellow Fever). Library of Congress (Explore in Banking, Delaware Avenue, and Girard College). Library Company of Philadelphia (Explore in Abolitionism and Slavery and the Slave Trade). The Underground Railroad From Slavery to Freedom (Explore in Abolitionism and Streetcars). Encyclopedia of Greater Philadelphia (Explore in Immigration 1790-1860 and Nativist Riots of 1844). Library Company of Philadelphia (Explore in Immigration 1790-1860 and Nativist Riots of 1844). Library Company of Philadelphia (Explore in Immigration 1790-1860, Nativist Riots of 1844, and South Philadelphia). Library of Congress (Explore in Civil War Sanitary Fairs). Courtesy of Mary Anne Eves (Explore in Civil War Sanitary Fairs). Library of Congress (Explore in Abolitionism, African American Migration, South Philadelphia, and Streetcars). Visit Philadelphia (Explore in Immigration 1930-Present). Historical Society of Pennsylvania (Explore in Settlement Houses). Historical Society of Pennsylvania (Explore in Public Baths and Bathing). Special Collections Research Center, Temple University Libraries (Explore in Settlement Houses). Philadelphia Tribune (Explore in Pennsylvania Emancipation Exposition). Delaware Historical Society (Explore in Roman Catholic Education). Special Collections Research Center, Temple University Libraries (Explore in Streetcars). John J. Wilcox LGBT Archives of Philadelphia (Explore in AIDS and AIDS Activism). Visit Philadelphia (Explore in Immigration, 1930-Present). 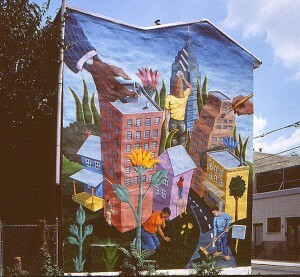 City of Philadelphia Mural Arts Program (Explore in City of Brotherly Love). Lenape people of the mid-Atlantic region cooperate across a network of independent communities. Generosity is expected from those with status and power. Region attracts diverse settlement including Dutch, Swedes, Finns, English, Germans, Scots Irish, and Africans (transported as slaves). 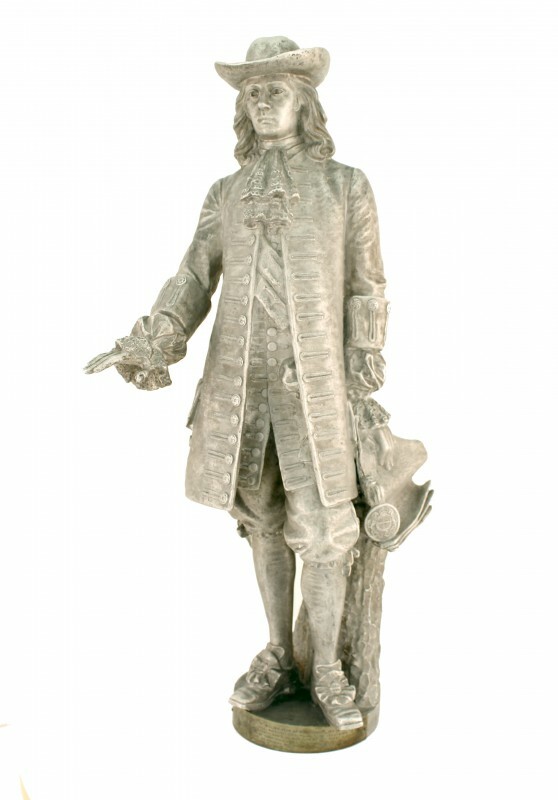 1681: William Penn chooses Philadelphia — in Greek, “city of brotherly love” — as the name for the city to be created in his new province, Pennsylvania. 1720s: Alarmed by surge in immigration by Germans and Scots Irish, English-dominated Pennsylvania Assembly approves a tax to discourage more. 1732: Friends Alms House opens. 1736: Union Fire Company founded. Locally-organized boycotts and Committees of Correspondence press for independence from Great Britain. 1775: Pennsylvania Abolition Society founded. 1780: Ladies Association of Philadelphia raises money to aid soldiers; Pennsylvania passes Gradual Abolition Act. 1787: Free African Society founded. 1788: Republica v. Teischer (Pennsylvania Supreme Court), first documented case of an American convicted for animal cruelty. Image credit: Historical Society of Pennsylvania. While meeting in Philadelphia, U.S. Congress passes a Fugitive Slave Act (1793) and the Alien and Sedition Acts (1798). 1793: Physicians and public officials organize response to yellow fever epidemic. Free African Society volunteers to assist; leaders later refute whites’ accusations of profit-taking. 1827: Mechanics Union of Trade Associations founded, leads movement for ten-hour day. 1828: Philadelphia House of Refuge opens. 1830s: Race riots target free blacks. 1838: Pennsylvania Hall (pictured here), dedicated to free speech, attacked and burned during Anti-Slavery Convention of American Women. 1840s: Increase in Irish immigration; nativist reaction triggers riots in 1844. 1855: Passmore Williamson, a Quaker, jailed for refusing to produce accused fugitive slaves for U.S. District Court. 1861-65: During Civil War, Philadelphians provide medical care and raise funds with the Great Central Fair (1864, pictured here). 1870s: Origins of Philadelphia’s Chinatown. 1880s: New immigration surge begins from southern and eastern Europe. 1892: St. Mary Street College Settlement (later College Settlement of Philadelphia) opens to aid immigrants; other settlements follow. 1900-20: Great Migration more than doubles Philadelphia’s black population, from 63,000 to 134,000. 1905-18: Immigration doubles Philadelphia’s Jewish population, from 100,000 to 200,000. 1908: Spanish-American Fraternal Benevolent Association founded. 1914-18: WWI mobilizes homefront patriotism but also leads to anti-German intolerance. 1918: Race riot ensues after African American woman moves into white neighborhood (2936 Ellsworth Street). 1930: Committee on Unemployment Relief founded to aid jobless families. Many whites move to suburbs as black population increases in second wave of the Great Migration. New populations of Puerto Ricans, other Spanish-speakers, Asians, and Africans arrive. 1951: Philadelphia establishes Human Relations Commission to enforce civil rights laws. 1953-68: Campaign to desegregate Girard College (pictured here) culminates in victory with Supreme Court decision. 1950s-70s: New Latino associations form to serve growing population; include Council of Spanish Speaking Organizations-Concilio (1962), Congreso de Latinos Unidos (1977). 2006: “This is America: When Ordering Please Speak English” sign at Geno’s Steaks sparks controversy. 2008: City of Philadelphia gains population for the first time since the 1950s, propelled mainly by immigration. Feldberg, Michael. The Turbulent Era: Riot and Disorder in Jacksonian America. New York: Oxford University Press, 1980. Charter of Privileges (digitized), American Philosophical Society, 105 S. Fifth Street, Philadelphia.